Watch this prerecorded webinar from SymQuest and KnowBe4 to learn why your employees are your company's biggest security vulnerability and what you can do to reduce the risk. It happens every single day—people open emails from unknown senders, click on mysterious links out of curiosity, and even plug unknown USB drives into their computers. Human error is the cause of the majority of business cyber attacks. It’s not because people are trying to be malicious; it’s the result of preventable mistakes. 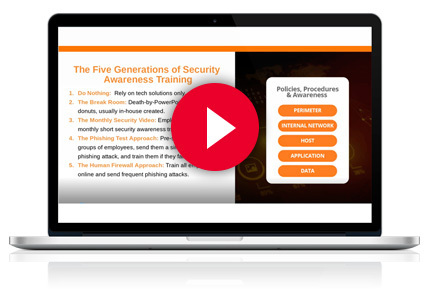 How to provide security awareness training that works. How to track employee progress toward creating a more secure work environment. © 2019 SymQuest Group, Inc.